It was a fantastic party and everyone had a great time! The BEST compliment of the day came from my biggest bugger who has told us that he now wants the same exact party for his June birthday! 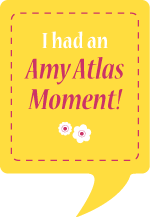 A HUGE thank you to Amy Atlas for featuring the party on her fabulous site!!! LOVE IT!!! You did an amazing job Jenny!!! OH MY WORD!!!!!!! I LOVE it alllll! How will I ever do this theme next year now, and make it JUST as cute! I love ALL the details, especially the watering cans with clouds and the adorable frame with rain drops and clouds. Wow, oh wow!!! OH MY!! Such an adorable party!! 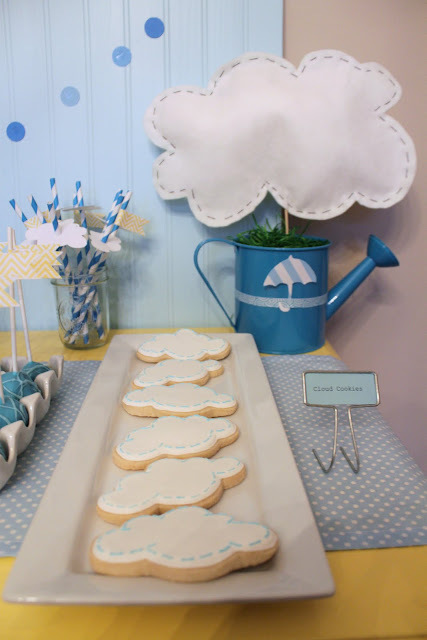 The umbrellas hanging upside down with the balls was so clever..and the felt clouds on your table..super cute! Amazing details..great job! 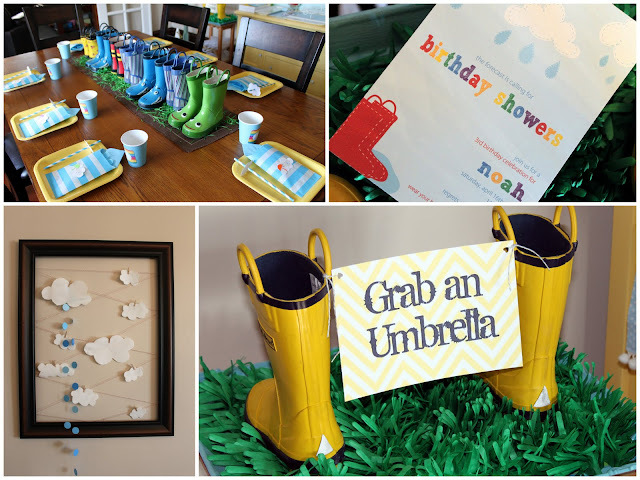 Such an adorable and SUPER creative party!!! I love every single thing about it! SO cute! I love a unique theme! So many cute details. Love the umbrellas holding the lanterns. I would have never thought of that! That is amazing! So many details that I just adore ... the clear umbrellas are a favorite! What an amazing party. I'm a new follower. 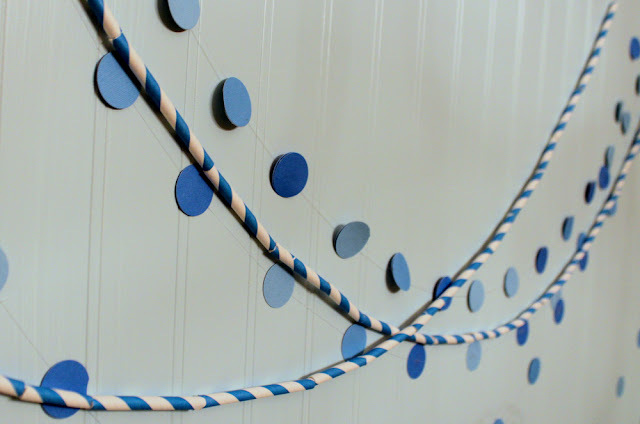 I love this so much that I blogged about it! OMG Jenny, this is so awesome! great job! 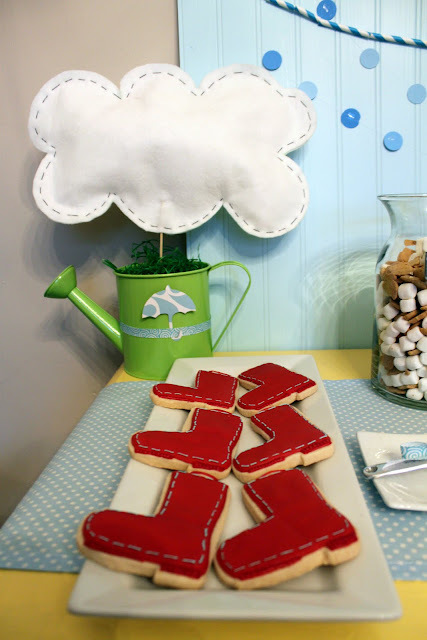 I love the all the clouds and rain boots. The hanging umbrella's are so sweet! 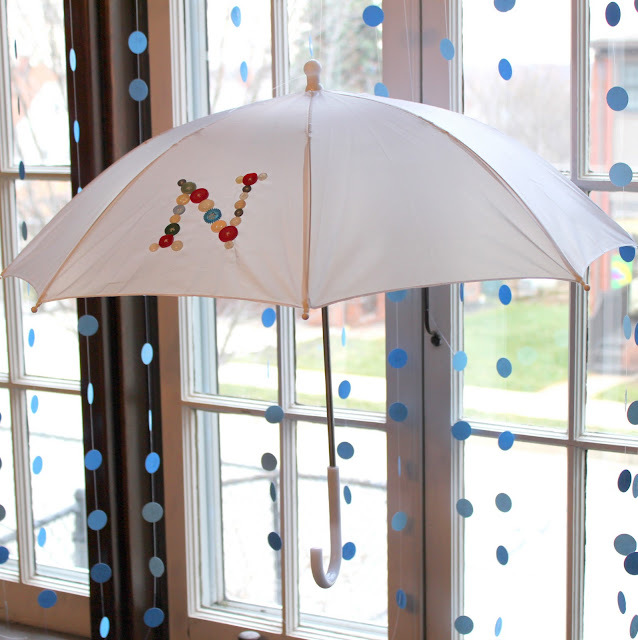 Ever since I saw your umbrella favor sneak peek, I knew this would be amazing and um, it was!!! Running off to share! GREAT job on the party and the cake balls, YAY, they look great! Oh my gosh... this is amazing!!! 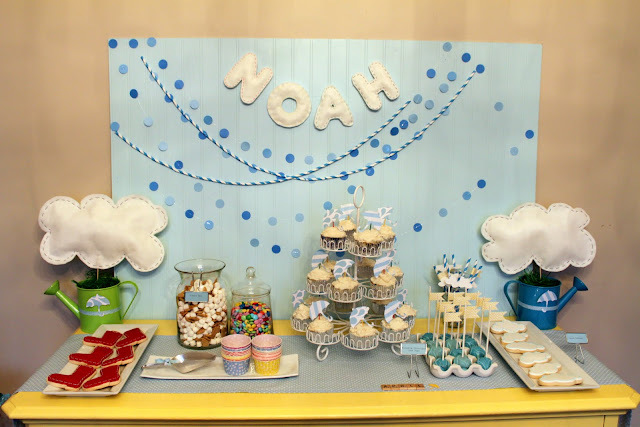 I'll be adding this to one of my picks for my Birthday Party Inspirations post (which I'll be sharing sometime after Easter). I love your ideas!!! Very nice job! It was a really fabulous party! Absolutely adorable!! I love the lanterns in the clear umbrellas!! beyond love, such a great party! 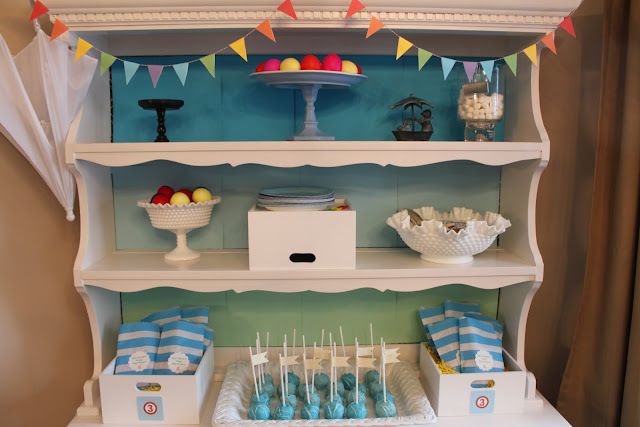 What an ADORABLE party theme! So very cute!! Adorable styling too. Love the umbrellas holding the paper lanterns!! This is SUCH a cute party! Love every detail! I just found your blog and am your newest follower! This party is AMAZING!! Thanks for creating such a fab blog full of inspiration. AMAZING!!!!! Everything looks so super duper cute! Great, great job!!!! Love it! You did a FABULOUS job with this theme! I LOVE every single detail! The table with 'grab an unbrella' might be the cutest thing ever! Fabulous fabulous party!!! Love it all! Love this! Everything is just adorable. You did a beautiful job Jenny! I love the upside down umbrellas, that is so cute! Everyone has beaten me to all the comments I meant to make!!! 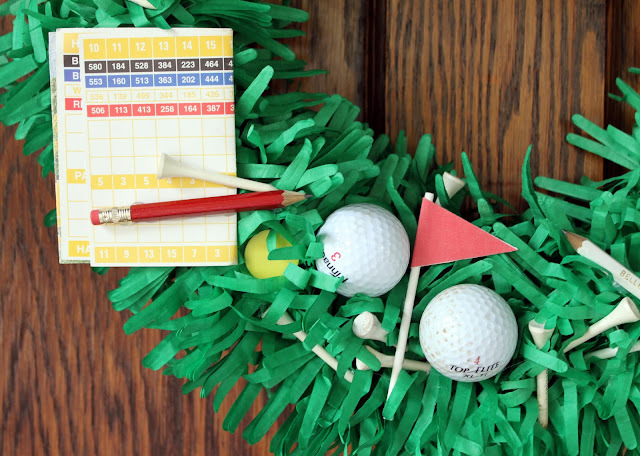 AMAZING party details, down to the very last tiny or simple one! Love your creative ideas! So original! I am beyond in love! You did an amazing job!! So incredibly creative! Love the rain puddle cupcakes. Yummy! I'm your newest follower. Oh my! Such great ideas!!! Simply Fantastic! cute party! i loved the raindrops and clear umbrellas! this is SO ADORABLE! I love every bit of it. great job! Everything about your party is perfect!!! Adorable!!! That is the best bithday theme i've seen recently !! Featured this today on my "Walk Around Blog Land." I just can't find the words...your party has left me speechless!! Gorgeous!! Thank you so much for sharing at the Tuesday To Do party! Amazing! This is one of the cutest party I have seen, great job! don't think this party can be topped! 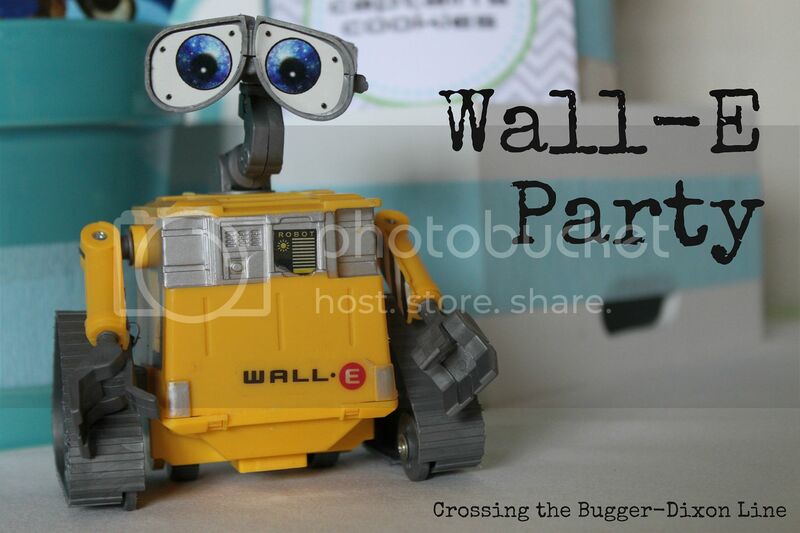 Seriously, cutest theme and decor...just precious :) glad I found your blog through embellishing life!!! This is the cutest birthday party idea ever! I LOVE the upside down umbrellas with the balls. Really great ideas! I bet it was a blast! This is SO CUTE!! I love everything! This truly is my favorite party EVER! It is unique, colorful, fun and so well done! Thank you for sharing all the details and creativity. I shared this party on my Friday Favorites post today. I have a featured button if you want it. Have a beautiful weekend! Hi Jenny! Just wanted to let you know I'm adding this to my To Do List tomorrow. Feel free to stop by and pick up a button! I'm in awe of all your creative touches! What a beautiful party! I love the way you hung the umbrellas and filled them with the colorful lanterns. I'm honored to have such a quality and creative post shared at "A Little Birdie Told Me..." Tuesday at Rook No. 17! Wow! 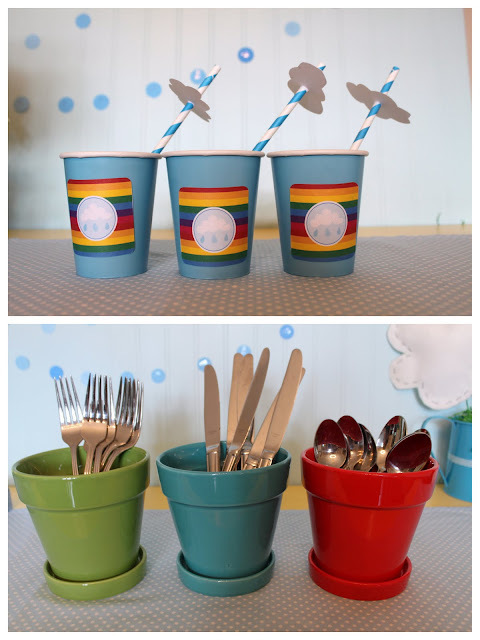 This is by far THE cutest rainbow-type themed party I've ever seen. I love it! I'm saving it for future party ideas. I loved the clear umbrellas with the coloured tissue balls. Loved the cupcakes (please share how this was done with the raindrops inside). Loved it all! Ahhh! This is so darling! I love it. Great job, woman! amazing, decoration-celebration, I love it! Did you notice... I shared this amazing party at my Birthday Party Inspirations. Just LOVE it! Stop by for an A++ button for your post! that's awesome!!! I love it! Where di dyou get all of the rain boots from? I've been trying to find some that are a decent price. This is adorable! My little girl is an April baby so I will bookmark this for next year. Very well thought out party!!! 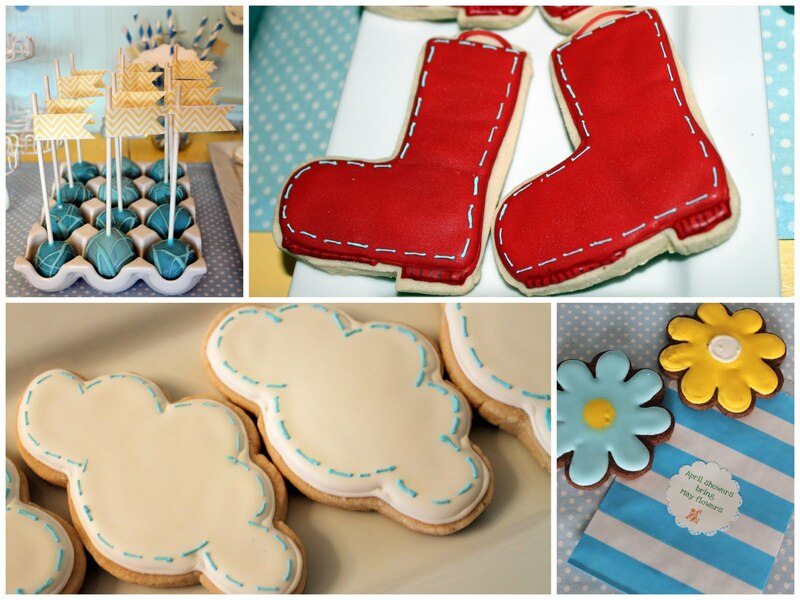 This is one of the cutest party ideas EVER!!! I love everything, and may have to 'steal' the idea sometime :o). Woah what an awesome party! There are so many great details and everything looks so professional and perfect. I am quickly adding this to my raindrop roundup. Thanks for the comment. 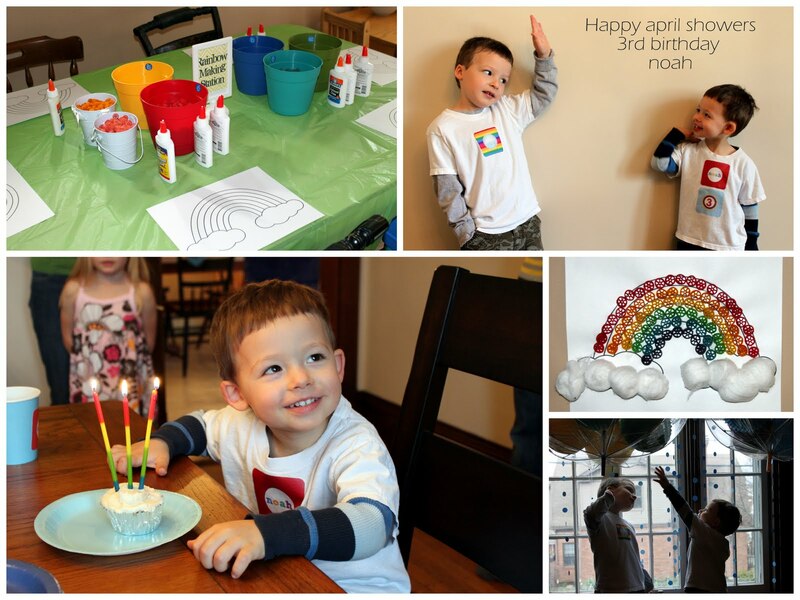 Love it so much I had to share on my website in our Birthday Party series!! Great Work!! Visiting from Bird's Party Blog. And now following. 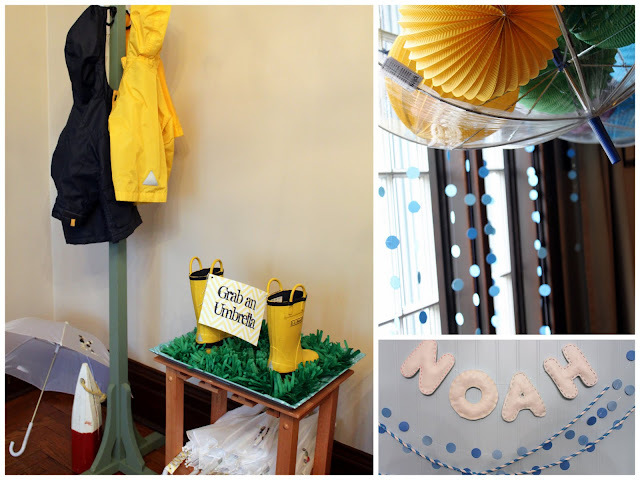 This would be a perfect baby shower theme. Lobe everything about this party. You did a great job. Hi Jenny! Found your work on Pinterest, loved your blog and mentioned this party on my blog. Great job! So inspiring :) Thanks for sharing. Jess LC Inspiration Board | Please Vote!